The Pennock Company was founded in 1882 in Philadelphia by Charles E. Pennock. Originally called the C.E. Pennock Company, the name was changed to the C.E. and S.S. Pennock Company in 1886 when C.E. Pennock's half-brother, S.S. Pennock, joined the business. 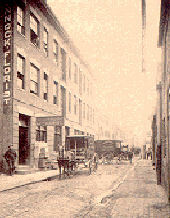 In 1890, the company purchased property at 1608 Barker Street (today Ludlow Street) in Philadelphia, which remained its headquarters for 75 years. The Pennock Company pioneered the concept of floral wholesaling. During Pennock's first three decades, a great deal of effort was devoted to establishing and gaining acceptance for this new type of business by providing services to both the grower and the retailer. For many of those years, business hours were 6:00 a.m. to 9:00 p.m., six days a week, and until noon on Sundays. At the time, a 90-hour work week was expected of wholesalers, except when longer hours were required during holidays. At one point, Pennock's best customer, a Philadelphia retailer, told C.E. Pennock that if he wanted to keep his business he must be open 24 hours a day. Always eager to satisfy their customers, the company experimented with this idea until, after many nights without a single sale, the decision was made to resume the “early” closing at 9:00 p.m. Deliveries in the early days were by messenger, horse and wagon, rail express, or baggage master. Incoming shipments from growers arrived the same way. Through effective sales promotion — and possibly due to a general lack of competition — Pennock became a key floral wholesaler with daily rail express shipments to retailers in cities as distant as Pittsburgh, Cleveland, Chicago, Minneapolis and St. Louis, as well as relatively nearby New York, Boston, Baltimore and Washington, DC. By 1909 sales in Washington had grown to the point where it became necessary to open the first branch location. In 1910, the company opened its second branch, in New York City, and a third, in Baltimore, in 1913. Including Philadelphia, these four offices saw the company through World War I and the 1920s until the fifth branch was opened in Newark in 1931. Expansion was rapid after that, with branches opening in Boston (1937), Norfolk (1946), Jacksonville (1947), Pittsburgh (1951), Miami (1953), Orlando, Camden (now Pennsauken) and Uniondale (all 1955), Springfield, Massachusetts (1956), and an office in Philadelphia’s Germantown section (1957). The Germantown office was consolidated with the Philadelphia operation when the company moved from Ludlow Street to Stokely Street in 1965. In 1970, the Pennsylvania Cut Flower Supply Company in Reading was purchased and became the company's 16th branch location. This was the peak of expansion. Since then operations have been consolidated at larger, more convenient locations based on the needs of today’s customers. Today, the Pennock Company continues to grow, with more than 350 associates in eight locations along the Eastern Seaboard from Florida to Massachusetts. In 1982, following the death of Samuel S. Pennock, the company became employee owned.